Professional wheel free scissor lift, built in version. The two lifting tables controlled by an all-in-one control unit are hydraulically synchronised and go thereby exactly equal up and down. There are two heavy hydraulic cylinders and a tip-lever-system for powerful lifting. 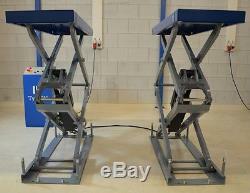 Set of 4 rubber blocks - free of charge Hydraulic hose set, anchoring bolts and accessories included. 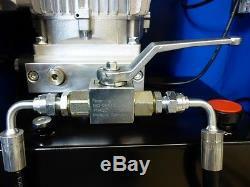 Supplied ready to use, hydraulic oil filled, Plug-and-Go! New, unused, packed in a sturdy wooden box, 825 kg, 160 x 60 x 78 (LxWxH / cm) with control unit 65 Kg en 54 x 45 x 116 (LxBxH/cm). Comes with installation and operation manual. 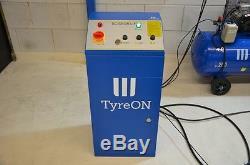 We carry large stock, the TyreON TSC3200X2iL can be supplied immediately. The customer will be invoiced with price + 0 % VAT. The customer will be invoiced with price + 21 % VAT. (21% is the Dutch VAT rate). Details TyreON TSC3200X2iL scissor lift in ground. Lifting capacity 3200 kg Maximum lifting height (gross) 2130 mm Required depth for installation 330 mm Time lifting / lowering 40 / 30 sec at 1500 kg load Length scissorlift 1640 mm Total length scissorlift 2040 mm extended Width lift tables 550 mm Engine Power 2.2 kW Voltage 415 Volts, 3 phase, 50 HZ Low noise <= 68 dB Required air pressure (air compressor) 6 8 bar. 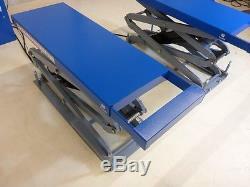 In ground, saving space and 40 cm extendable lifting tables. 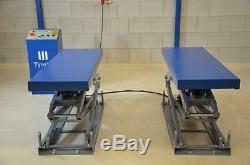 Both lifting tables are extensible from 164 cm to 204 cm. Especially suitable for cars with a longer wheelbase. Adjustable lowering speed and hydraulic operating pressure. Reliable powerful machine, manufactured according to ISO 9001 with CE certificate. Telephone assistance from Monday to Friday 9:00 - 17:00 clock. The sales, showroom and warehouse are open daily. The item "TyreON TSC3200X2iL scissor lift in ground 3.2T, table length 164-204cm 400V" is in sale since Friday, June 30, 2017. This item is in the category "Vehicle Parts & Accessories\Garage Equipment & Tools\Workshop Equipment & Supplies\Lifting Tools & Machines". The seller is "sns-trade" and is located in Akersloot. This item can be shipped to United Kingdom.